Want to find and keep fulfilling, lasting love? I’ve compiled a helpful list of 11 signs you have found a happy relationship. Read on – and see how many of these 11 your relationship fulfills. Plus when you look at this list, be sure to think about your relationships which did not work out – and consider what you might have been missing from this list. Scroll down further and you’ll see that I’ve turned this list into a handy dandy poster you can print out and keep in your wallet or tape on your bathroom mirror. Be sure to remind yourself often about what you need to be happy in love. Want more support? 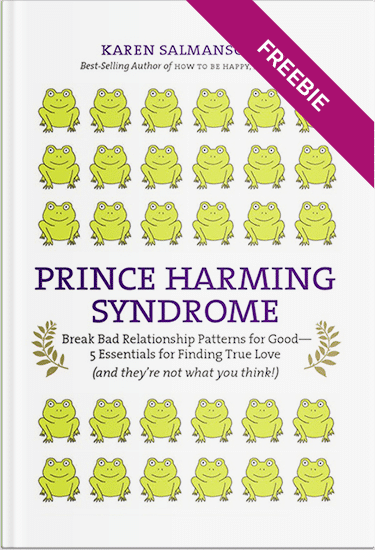 Check out my bestselling relationship book, Prince Harming Syndrome – which I’m now giving away for free for a limited time. And yes, the book applies equally to Princess Harmings! You feel safe to be your truest self. You feel safe that THEY are being their truest self. You have bad math. It’s as if 1 + 1 = 3 when you’re together. You each lift the other higher. You deal with conflict without breaking dishes, eardrums or hearts. You support each other’s self evolution. Actions are in sync with words. You have strong communication – which means you’re not only good at talking to each other. You’re good at listening to each other. You enjoy a healthy fusion of partnership and freedom. You double one another’s good times – and halve the bad times.